It’s officially summer in New York. The weather is sticky hot, tourists are everywhere, and somebody is bumping bass-heavy music nearby. The New York Liberty WNBA basketball team loves to turn up favorite summertime jams on and off the court. The Liberty ladies rely on a variety of artists, from Monica to Kodak Black, to set the mood for doing layups or just lying out by the pool. 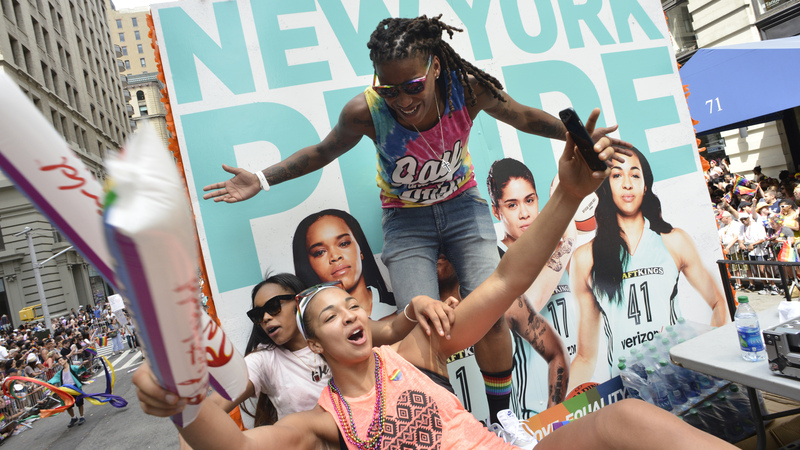 Shavonte Zellous and Kiah Stokes of the New York Liberty participate in the NYC Pride Parade on June 25, 2017 in New York City, New York. Kiah Stokes loves to switch it up between trap music and R&B, which keeps artists such as Fetty Wap and Usher on her rotation. Meanwhile, Stokes’ teammate Nayo Raincock-Ekume vows to rock with Drake until the end of time. The Liberty team is currently 7-5 this season and continues to play well this season. Ultimately, they hope to make it to the Finals.